A bathroom can be a person's own getaway, so why not make your design choices all about you? When you're doing renovations and shopping for decor, follow your own personal preferences. With these in mind, you'll make the room all your own. What's your favorite color? Use it as the basis for your design changes. If you're into pink, paint your walls to show it. Maybe cooler hues makes you feel good - why not find some bright green tiles to line the floor? Vary the shades of the color you choose. Match red painted walls with a pink toilet and sink. This will mix things up a bit, while keeping with your preferences. 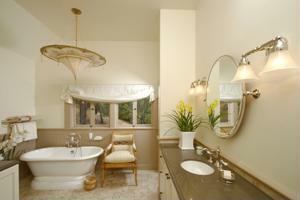 Interior24, an interior design website, offers a few ideas to making distinctive choices with bathroom design. If you dig the vintage feel, there's no reason why you can't base your facilities on this style. The source shows that large, dark red wall tiles bordered with an antique floral design, can establish this feeling. You might consider getting an antique bathroom vanity as well. These pieces have a unique quality, often with engraved surfaces and a worn-in look. Find a large decorative mirror you like to hang over the piece, too. Additionally, you'll want to choose a bath or shower that's perfect for your personal relaxation. If you like to unwind in the shower, you might consider a steam-style fixture for your bathroom. With their multiple jets, massage features and mood lighting, you'll truly pamper yourself with this installment. If you like to take an occasional bath, consider a whirlpool or soaking tub. Maybe you've made these decor changes, but you still aren't totally satisfied. A London restaurant shows you how to make bathroom fixtures your own. Eater National reports that the London restaurant Fifteen has temporarily shut down for renovations that include custom-made toilets. Jamie Oliver, the chef and owner, claims that to clamp down on people who'd been taking off with the toilet's handles, and other parts, he's branding the utilities. His new toilets have a tasteful engraving of the restaurant's name on them, so that patrons are fully aware that the pieces are Fifteen's private property. If you similarly want to impose yourself on your bathroom fixtures, you can do so by putting your monogram on everything from the hand towels to the shower curtain.